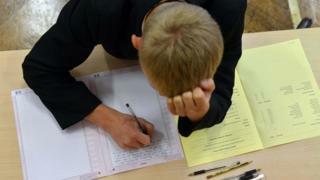 Many head teachers in England will refuse to make all pupils study five traditional GCSE subjects, a director of a prominent education body has said. Bill Watkin, operational director of the school support and training body SSAT, said many heads felt the EBacc was not appropriate for all youngsters. It comes as Education Secretary Nicky Morgan confirmed pupils would have to study the EBacc from September. She said the move would ensure pupils received a rigorous academic education. From September, all pupils starting secondary school will have to study English, a language, maths, science and history or geography at GCSE, in the EBacc. Those schools that do not have 100% of pupils studying this set of subjects as part of their GCSE courses will not be able to obtain Ofsted's top rating of "outstanding". The government said the wraparound qualification had been introduced to ensure pupils from disadvantaged backgrounds were not deterred from studying academic subjects. A Department for Education spokeswoman said: "As part of our commitment to delivering real social justice, we are determined to ensure that every child who is able studies the core academic subjects that will set them up for later life and help them reach their potential. "We will work with the sector to make sure there are enough teachers with the right skills and knowledge to allow pupils to study EBacc subjects at GCSE. "Teaching remains a popular career and we provide bursaries for those training to teach many of the EBacc subjects." The proportion of pupils entered into the EBacc has almost doubled in recent years, rising from 22% in 2010 to 39% in 2014. But Mr Watkin said: "The risk is that pupils who can't access some of these subjects will become disaffected and disenfranchised. "It may cause some pupils to do less well in their exams." He said a recent snapshot survey of members had been inundated with school leaders saying they would rather lose their top rating than adopt a one-size-fits-all approach. Mr Watkin said there were also serious consequences for school staffing, with dramatic changes needed in about half of schools. The likelihood was that the arts, technology, physical education and religious studies would be lost to accommodate compulsory history and geography, he said. His views were echoed by Brian Lightman, general secretary of the Association of School and College Leaders, who said: "We do believe in a broad academic grounding for everybody, but I believe the EBacc is too rigid. "There are some schools that are very concerned that this rigidity will not meet the needs of their students. "Therefore, they will offer a broad academic grounding, but they will not offer these specific subjects, even if that means they would lose their outstanding grading." NUT general secretary Christine Blower said: "A bad idea has suddenly become much worse. Parents, like teachers, want a broad and balanced curriculum for their children. "It is the responsibility of government to translate that aspiration into a curriculum that reflects the many demands that are made on the school, and that can involve and engage all learners."